I remember thinking, “This is a smart guy, and I guess smart guys speak in riddles,” as I puzzled over a piece of advice I received many years ago. I had just met Bob Farrell shortly after he retired as head of the technical analysis research team at Merrill Lynch. As I walked away, the friend who had introduced me to Farrell explained that analysts at Merrill Lynch were among the best in the business because Farrell pushed them to find information no one else had. Their job was to develop insights about data and news that everyone in the business had access to. Good analysis means simply having an edge over everybody else because you worked harder and found ideas where no one else was looking. Farrell taught me that if I use the same ideas and indicators everyone uses to know what everyone knows, I should expect nothing better than average results. For example, there’s the U.S. Weekly Leading Index (WLI) of economic activity published by the Economic Cycle Research Institute (ECRI). 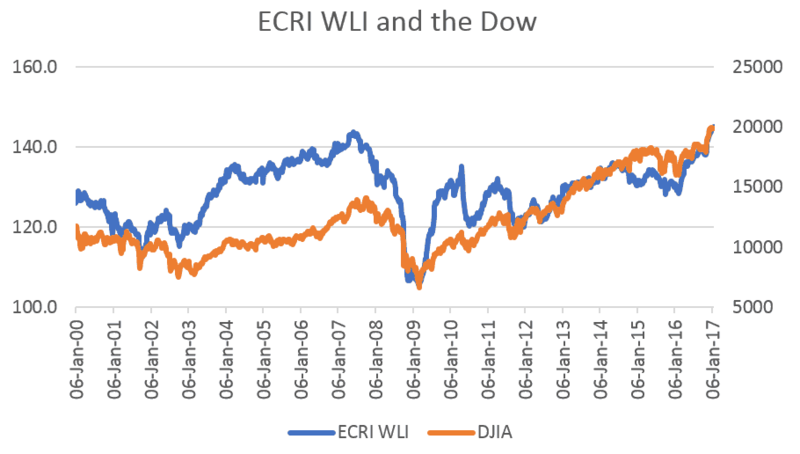 The ECRI is one of the most respected economic forecasting firms in the world. It was founded by Geoffrey Moore, an economics professor who was former Federal Reserve Chairman Alan Greenspan’s teacher. Greenspan cited Moore as an important influence on his thinking and “a major force in economic statistics and business-cycle research for more than a half-century.” Moore’s work focused on forecasting recessions, and the ECRI still publishes indexes based on his work. I could spend hours writing about Moore’s work, but I know my readers usually want the bottom line. The WLI is intended to forecast recessions, but it is also useful for forecasting the stock market, as the chart below shows. Looking closely at the chart, you can see that the WLI turns up or down shortly before most major market turns. Now that you know the WLI is useful, let’s look at what’s in it. The index includes corporate bond yields, prices of industrial materials, the number of business failures, changes in money supply and new claims for unemployment, among other components. These are all leading indicators that show what is likely to happen in the economy. For example, if yields on bonds and prices of industrial materials are rising, the economy is usually growing. Unemployment claims rise as the economy slows. Moore’s formula accounts for all these variables and gives us a single number telling us what to expect from the economy and the stock market over the next six months. New highs in the WLI forecast new highs in stocks, and the WLI is now at a 350-week high. This is a strong uptrend, and, in the past, buying when the WLI was this strong resulted in extraordinary gains. Over the past 50 years, since the WLI was first published, the Dow Jones industrial average has delivered an average annual return of 16.2% when the WLI is this strong. Strength in the WLI can last for years. As one example, it broke to a new 350-week high in January 1985 and eventually turned lower in August 1987 — after the Dow had gained 126% and just before the largest one-day percentage drop in the Dow’s history. The WLI will eventually slow down, but it pays to be bullish as long as the index keeps making new highs. The Dow has delivered returns that are 50% above average when the WLI is reaching new highs. This is all good news for stocks and the economy. Remember, the WLI was originally designed to forecast economic strength, and this is the latest confirmation that the economy could finally be breaking out of its slump. The WLI is an indicator you may not have followed before. But as I learned from Farrell many years ago, you have to follow indicators that are outside the mainstream if you want better-than-average results in the financial markets. Remember: To know what everyone knows is to know nothing. Having information few others have is an edge in the markets.